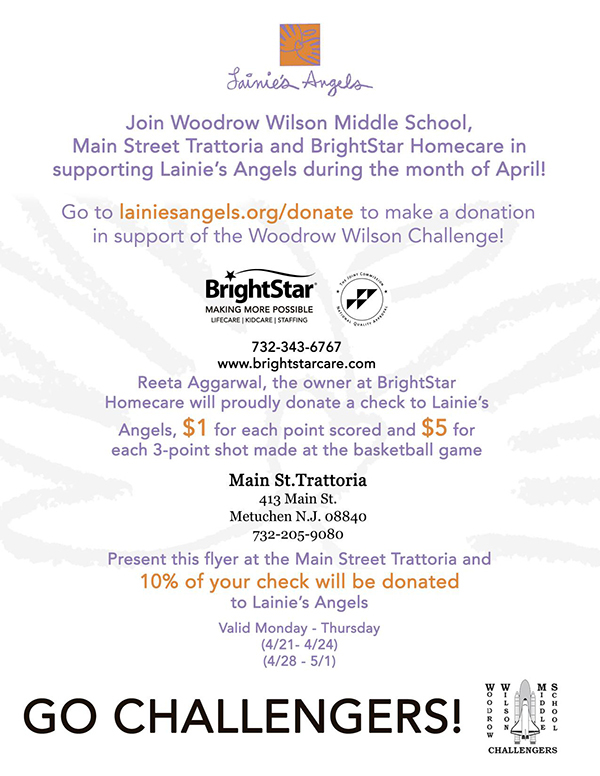 Woodrow Wilson Middle School in Edison, NJ will host the Annual Lainie’s Angels Student-Teacher Basketball Game, to be held on Thursday, April 24th 2014. You can support the kids at WWMS by participating in the Woodrow Wilson Challnge for the next two weeks. Make a secure donation on our website, or dine at Main Street Trattoria in Metuchen, NJ - Monday-Thursday the week of April 20th and the April 27th. Please print out the flyer below and bring it with you to the restaurant, and 10% of your bill will go to Lainie's Angels! CLICK HERE TO PRINT FLYER!